Το Florian Pension, στην περιοχή Γκαπιεόνγκ-επ σε Γκαπυεονγκ-γκαν, αποτελεί δημοφιλή επιλογή για τους ταξιδιώτες. Από εδώ, οι επισκέπτες μπορούν να έχουν άμεση πρόσβαση σε όλα όσα η πόλη έχει να προσφέρει. Από τη βολική της τοποθεσία, η ιδιοκτησία προσφέρει εύκολη πρόσβαση σε κορυφαίους προορισμούς της πόλης. Οι εγκαταστάσεις και οι υπηρεσίες που παρέχει το Florian Pension διασφαλίζουν την ευχάριστη διαμονή των πελατών. Κατά την διαμονή σας σε αυτό το υπέροχο ξενοδοχείο, μπορείτε να απολαύσετε τα δωρεάν WiFi σε όλα τα δωμάτια, αυτόματο πλυντήριο, φύλαξη αποσκευών, ασύρματη σύνδεση Wi-Fi σε δημόσιους χώρους, χώρος στάθμευσης οχημάτων. Ελάτε σε ένα από τα 3 φιλόξενα δωμάτια και ξεφύγετε από τα άγχη της ημέρας με μια ευρεία γκάμα ανέσεων, όπως επίπεδη τηλεόραση, καθρέφτης, καναπές, ασύρματη σύνδεση internet (δωρεάν), κλιματισμός, που θα βρείτε σε ορισμένα από αυτά. Εξάλλου, το ξενοδοχείο διοργανώνει πολλά ψυχαγωγικά δρώμενα έτσι ώστε να έχετε πολλά πράγματα να κάνετε κατά τη διαμονή σας. Απολαύστε τις ασύγκριτες υπηρεσίες και μια πραγματικά περίβλεπτη διεύθυνση στο Florian Pension. I feel that the rate for one night is a bit over priced. But the owner, Mr & Mrs are very kind and nice. Mrs when approached for help, is always very ready and accommodating, although we do have language barrier. Florian Pension seem popular among the local taxi driver, I took one cab and the driver knew this place very well. So Florian Pension has earned its popularity in Gapyeong which makes it extra safe and extra easy to locate for tourists when travelled by taxi. I would like to take this opportunity to thank the owner for fetching me and my boys for more than one time during our stay in Dec 2018. We could sense the host’s hospitality even before our arrival as he offered to fetch us from Gaoyeong Station when we contacted him on KakaoTalk. When we finally reached Florian Pension, we were excited as it looked just like the website photos. A very cosy Korean home to stay! The best part was that it snowed on our last day there. The scenery was breathtaking! The host’s wife even prepared breakfast for us before we checked out! Clean and lovely house, the owner was so nice. Gave us information before our trip and take good care of us during the trip! Nice view nearby. The owner allow the 1/F BBQ until 2am which is very noisy. Owners were really friendly and helpful, even fetched us from bus terminal and send us back to the train station on check out. Would be good to prepare some stuffs from the supermarket to bring back stuffs to the pension. Very close to Namisan and nearby water sports. The host and his wife were wonderful. He fetch us from the airport, help us did some quick shopping at the grocery store nearby knowing that we will be too tired because there are no shops the place we stayed. We requested for a place and facility for us to barbeque the food we had bought for for a fee of 20K Won. He was kind enough to arrange for us a local taxi to take us to the ferry terminal to Nami Island. Excellent hosts! The pension owners are very friendly and nice. We arrived Gapyeong Station earlier than planned and called him and he arrived to pick us up in 20mins! He suggested to drive us to the supermarket nearby to buy food with us so that we could cook at Pension for dinner. The room is spacious and with an open kitchen and it was really a nice break from the busy city in Seoul. 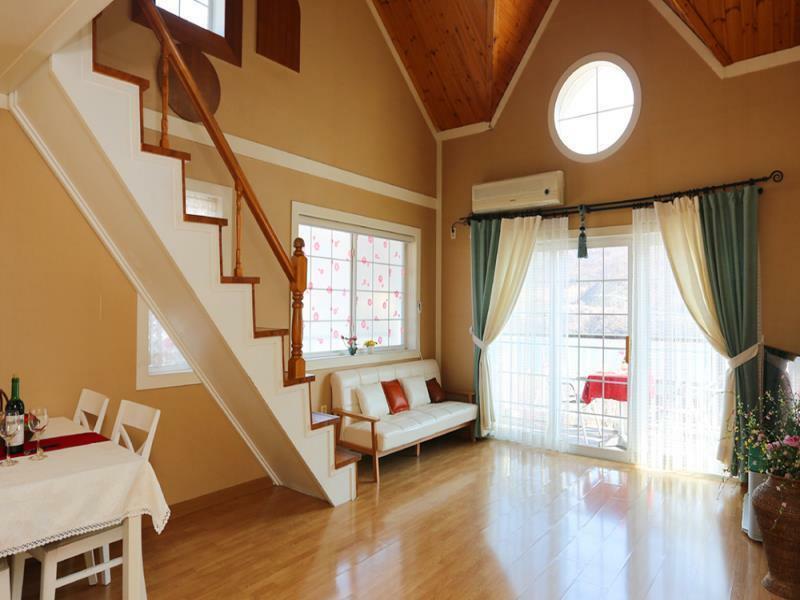 The Pension is next to the river with a very nice scenery and very close to Nami Island. The wifi is super strong and my son could relax and lay on the tatami and watch video. The next day, his wife greeted us and gave us the fresh tomatoes that she grown herself. This is really a very nice and warm experience and much difference from staying in a hotel. Price is very reasonable. House is beautiful. View is fantastic. I was especially impressed with the service and hospitality provided. Located on the riverside, the view from the terrace is fantastic. Pines in the farden are impressive. I wanted to stay one day more. I stayed 'Florian Pension' a day. Before I made a reservation, I worried so much. Because i didn't a car. Fortunately, 'Florian Pension' serves 'Pick up Service', so I didn't need to worry anymore. And Gapyeong City also operates shuttle bus. If you have a same problem, you also don't need to worry. When I got the Gapyeong Sation, the owner of 'Florian Pension' came there to pick us. While we're moving to the pension, the owner recommended us many tour attractions and tips for enjoying our tour. When I arrived, I was amazed. It was beyond my expectation. The pension is located in front of river and it also has a cozy garden. I could see the river through the window of our room lying on the bed. At night, we had a BBQ party. The owner prepared everything kindly, so we only brought meat, beverage and some food. If you need more food, a little convenience store is located nearby. It might be 5 min by walk. You can buy additional items. But the price was a little expensive than the supermarkets located near the Gapyeong Station. So I recommend you to buy at there in advance. And I heard the supermarkets also serve 'Pick-up Service' if you buy at the supermarket. Even it was winter, we had a great time in warm place thanks to the owners. And if the fire is dim, you can ask them to add more fire. They're willing to add. I really want to visit 'Florian Pension' again. Especially in summer. There is a facility to enjoy summer leisure such as water-skiing, banna boats, and so on near the pension. Anyway, it was the best pension I've ever visited so far and I look forward to visiting there again. I recommend you. 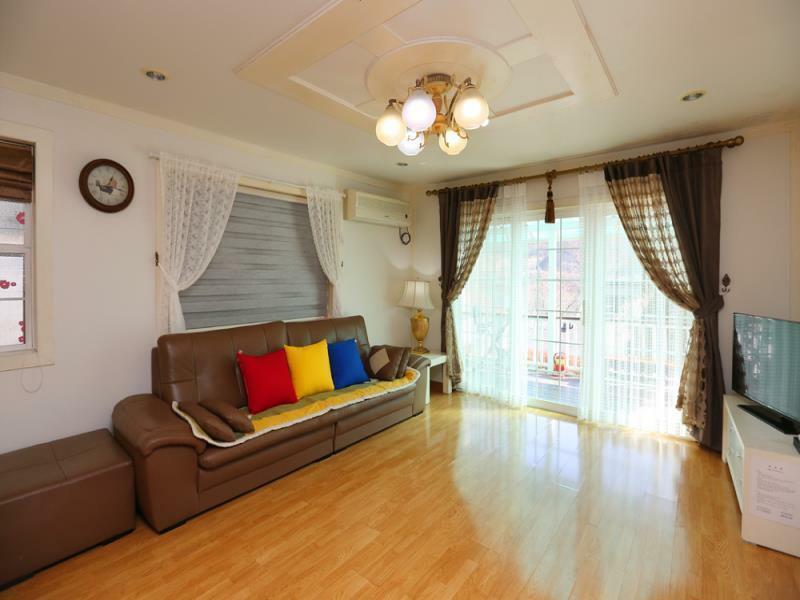 Excellence for relax, having good view, very near the river, 10 mins to the water sports station. We were enjoyed. But only one thing is about the location where a little bit far from the city, not convenient to the tourist attractions even the supermarket. For whom you are driving on ur own would be enjoyable and memorable. So, we will plan to drive then stay with Florian Pension next time. Strongly recommended.